It's the name of the breakthrough album from psychedelic indie-disco-rock group "electric six". Blog over. In my last blog, I talked about Scientific discoveries from 2016 which have the potential to change the world. 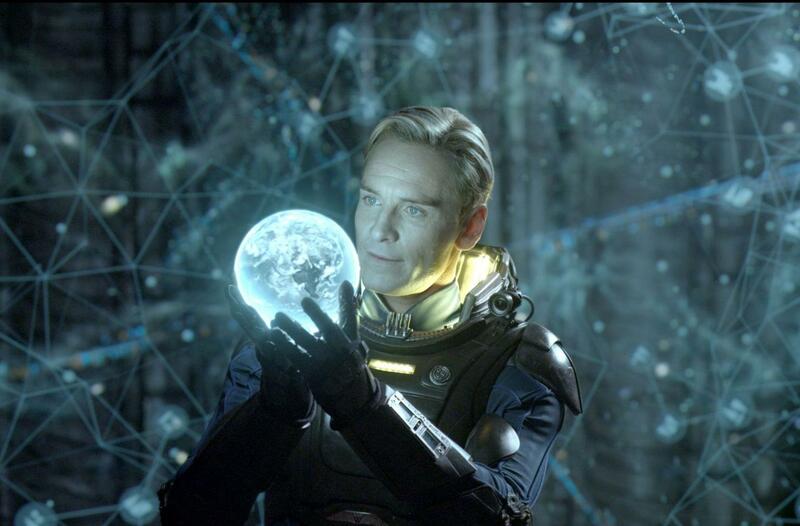 But that got me thinking: what was the very first Scientific discovery which shaped our destiny? The answer, I'm going to argue, was the discovery of fire. Nobody knows when we figured it out, but remains of man-made fires have been found dating back at least 400,000 years. We've been Science-ing for quite some time. Whatever method we used and however it was discovered, the invention of fire marked a watershed for humans because it allowed us to do things no other animal could. For example, early humany creatures were tree-dwellers because the ground was where the predators lived. Once we mastered fire however, we had the ability to scare other creatures off (even hunt them), and spend time on the ground, encouraging us to walk on hind-legs which changed our physiology. It also kept us warm, meaning we could expand into colder regions, gradually colonising the land and spreading out from Africa across the globe. Not to mention the ability to cook. It sounds like a small thing but cooking meat wasn’t just about taste. Cooked meat is easier to digest so fire allowed us to increase the calorie-content of our diet, which helped our brains grow...and that's been pretty good for us. Cooked meat also lasts longer, which helped us store it for the winter months. While other species froze to death, we were able to keep ourselves healthy and fed. There’s even evidence that early humans were using fire to treat metal spears, giving us an advantage in hunting. Ever tried to take down a mastadron with a fragile spear? Exactly. Whether it was helping us defend ourselves, expand our territory, get better food, stay warm, get healthier or increase our brain-pans, fire was one of the most important Scientific discoveries in history. The first and last word in primitive Chemistry. It may even be the reason we got such a head-start in the first place. It therefore seems only right to pay tribute to this mysterious and wonderful reaction. The classic story of Prometheus stealing fire from the Gods to give humans an edge may have some grains of truthiness! For his troubles, Prometheus was chained to a rock where a hungry bird devoured his liver for all eternity. Which is what it felt like to sit through this garbage. First off, fire isn’t a substance. While some of the early Greeks believed fire was one of the elements, we now know it isn't an actual "thing". You can’t store fire in a box or pack it away when you’re done with it. It’s a chemical reaction taking place between two chemicals: oxygen and any chemical that will react with it. We call this other chemical a fuel. Since the air is about 20% oxygen, there’s always a good supply, the only challenge is making it react with whatever we’ve chosen as our fuel. Oxygen and fuel chemicals don’t normally react, which is fortunate because everything (including you) would spontaneously burst into flame. To get a fire going the oxygen and fuel particles need to collide at high speeds so they can break each other up and rearrange to form new substances. In order to get a fire started you need to increase the speed of the particles which is Chemist-speak for “heat them up”. Temperature is a measure of how fast your particles are moving on average, so raising the temperature is really giving your particles enough energy to get going. And there’s all sorts of ways to do it. Rubbing the fuel very fast will work e.g. scraping two bits of dry wood past each other. So will striking pieces of sharp rock. The sparks which come flying off are tiny specks of rock, rubbed so fast they start heating up and reacting with the oxygen. Sparks are miniature fires of their own, and if you get a few dozen of them near something like dry grass, the heat can be transferred and things get going. Once you’ve put enough movement in, the reaction begins as the fuel and oxygen shatter into each other, creating a chaotic, whirling cloud of particle splinters. Like a battle between a billion microscopic star ships, the fast-moving debris of fuel and oxygen doesn’t last long. The molecular scraps will recombine in new arrangements as they cool, releasing their energy in the form of light. This seething mess of molecular-war is a fire. 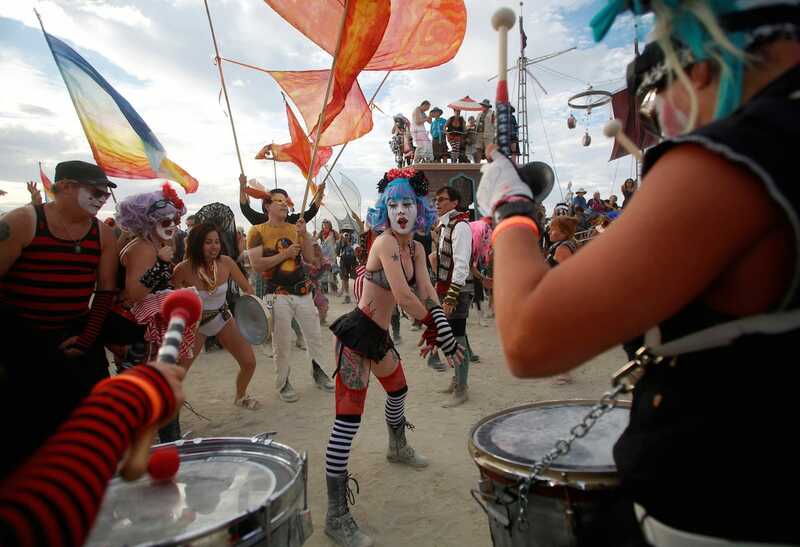 I couldn't find a picture of molecules that looked right, so instead here's a picture from the "Burning Man" festival. What exactly are we?? Why are fires "fire coloured"? The shapes and sizes of different particles floating in the fire will cause different coloured light to be released, leading to different flame colours. A lot of fuels like paper and petrol contain carbon. If there’s not much oxygen around a lot of these carbon atoms don’t get used in the reaction and clump together, forming soot. When soot gets hot the heat energy it absorbs is spat back out as yellow, giving us the familiar glow we recognise in common fires. But other fuels release different light. If you use copper sulfate the flame will be green. Switch it to copper chloride and you get electric blue. Lithium chloride burns pink and magnesium burns brilliant white with a rainbow edge. Wood contains a lot of the element sodium (the same chemical used in street lamps) which gives out orange light as it heats up, which is why wood fires are the same colour as street lamps. Of course, if you mix your carbon-based fuel with oxygen before the particles reach the source of heat, the reaction is more efficiently mixed and you don’t get much soot forming (because the carbon is all smushed in with the oxygen). These kinds of fires, called pre-mixes, glow blue. That’s why the flame on an oven hob is usually blue at the base. There’s hardly any soot being formed. As it gets higher however, there’s a less perfect carbon : oxygen ratio and soot starts to form, making the top of the flame yellow once more. What gives a flame its shape? The shape of a flame is the result of temperature differences and gravity. Something you’ve probably heard at some point is that heat rises. Not true unfortunatley. There’s something much stranger going on. When a group of molecules get hot they start flying in all directions, meaning a hot gas will expand as the particles spread out. But there’s something else we need to factor in. Every particle is also being pulled toward the earth by gravity. Hot gases and vapours, like those in the flame, are moving fast enough to fly in ALL directions, including upwards, but the surrounding cold air doesn't have this option. Cold air doesn’t have enough movement in its particles to escape gravity, so it has no choice but to gradually sink. This means a cold gas can only fall, whereas the hot gas is able to trade places with it. The cold air falls and forces the hot air upward because that’s the only place left for it to go. It’s not really hot air which rises, it’s cold air which falls better. Now let's consider our flame. We’ve got a bunch of hot gases and vapours tangling round each other. The cold air is constantly being pulled down and clumping at the bottom of the flame, where it suddenly gets heated up by all the fast moving (hot) chemicals already there. This means oxygen is constantly being pulled down into the flame. As the chemicals are heated, they are forced up by the constantly sinking cold air, but by the time they’ve gotten a few inches away from the fuel source they’re moving too slowly to keep reacting, so the flame won’t go on forever, and it dies out at the top. These combined effects of gravity, cold air sinking and oxygen being sucked in, give us the familiar tear-drop shape of a controlled fire. If you create a flame in a place where gravity isn’t behaving in the usual way however, it won’t be the usual shape. You can actually create spherical flames in a spaceship because the gravity is constantly changing direction as you move around the earth. 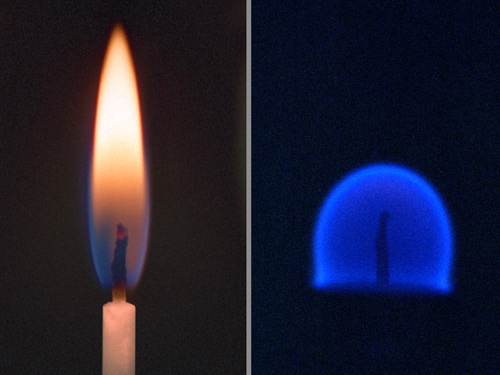 The photograph on the right is a flame in microgravity...no silly caption, just awesome! Remember earlier when we said that when chemicals rearrange they often give out light? Well not all of that light is in the visible region. In fact, a huge amount of it comes out in the form of infra-red light, which our eyes can't see, but which cause molecules to vibrate. 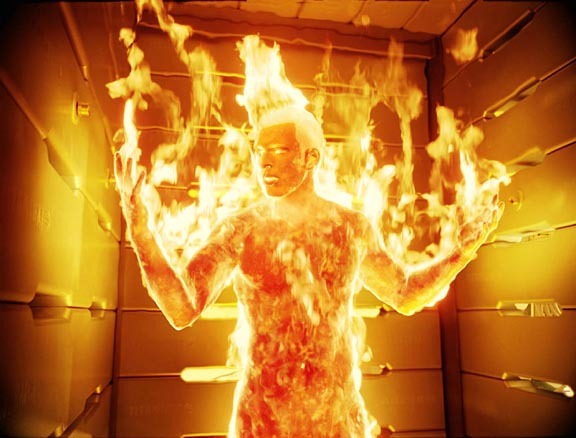 In other words, the chemical reactions in a fire tend to give out heat rays. These heat rays transfer energy from the chemical reaction to the surrounding molecules in a process called "radiation". There's also the fact that particles in the fire are moving fast and battering into the surrounding air, making them move faster too. This hot air hits your hand and your skin absorbs the shock, which you interpret as heat. This process is either called convection or conduction (depending on circumstance). Different chemicals will give out different amounts of energy when they react with oxygen, so different fuels will produce different flame temperatures. Jet fuel, for example, burns at around 800 degrees C, while an acetylene torch burns closer to 3,500 and a bunsen-burner flame at 1,500. Many people consider Chris Evans to be a hot guy. Why does water extinguish fires? To stop a fire we’ve either got to remove the fuel, remove the oxygen, or stop the particles vibrating fast (cooling it down). If we put a lid over the flame or squish it between our fingers, we’re cutting out the air supply and removing the oxygen. You’d think, therefore, that water should keep a fire going because every water particle contains oxygen. But obviously the reverse is true for some reason. Every water particle is made from an oxygen atom bonded to two hydrogen atoms and the bonds between these atoms are incredibly tough to break. The bonds in a petrol particle are very weak by comparison. You only have to get petrol up to about 126 C in order to make it catch. Water just keeps absorbing the energy with no sign of the bonds breaking, making it an excellent heat sponge. In order to burn water you have to heat it to about 12,000 C, anything below that and it will just vibrate faster. If you put water on a fire, the water molecules absorb the vibrations from the fuel and oxygen, meaning the fuel and oxygen molecules lose their speed, killing the reaction and stopping the fire. The water you throw on a fire will definitely heat up a little itself, but not enough to split the oxygen from the hydrogen. Why does blowing on a fire put it out...but also start it? If you blow on a flame gently, you’re supplying oxygen and a little bit of movement (heat) to the fuel so it can start breaking up. If you blow hard and fast you do something else. Provided the gust of air coming from your mouth is bigger than the flame, you end up making the fuel and oxygen spread out in all directions. They get thrown out into the surrounding air and immediately lose their energy to the particles there. Without that tight mixture of fuel, oxygen and movement, the flame can’t keep going. It's worth finishing off by saying that a lot of fire Chemistry is still unknown to us. The above explanations are simply our best theories, but there are many aspects of fire which are still unaccounted for. It was out first big breakthrough, it's still an area of much debate and discussion. Viva la Science.